Growing up my parents always kept our kitchen stocked with staples like carrots, celery, apples, and bananas. All of the kids in the neighborhood knew that they could grab a snack at our house, and we usually chose banana. What’s not to love, they come in their own wrapper, they are delicious, and they give you a good boost of energy. Little did I know way back when I was a kid that this staple fruit in my home would be such a powerful ally in helping my hair and skin look and feel its very best. The nutrient-rich flesh of the banana is what makes it such a valuable ingredient in nourishing hair and skin. You may already know that banana is high in potassium, but did you know its also packed with Calcium, Iron, Magnesium, Phosphorus, Potassium, Zinc, Copper, Manganese, and Selenium? Due to FDA regulations, we are unable to list all of the benefits these minerals provide to skin and hair, but we can say that they are all powerful nutrients in helping improve the look and feel of problem skin and dry hair. 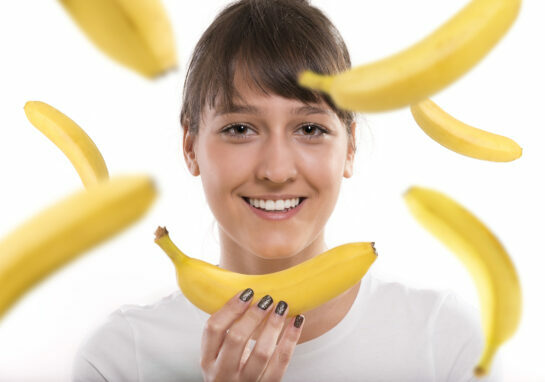 Banana is also rich in Vitamins such as Vitamin C, Thiamin, Riboflavin, Niacin, Vitamin B-6, Folate, Choline, Vitamin A (IU), Lutein & Zeaxanthin, Vitamin E (alpha-tocopherol), Vitamin K (phylloquinone). With such a complex nutrient profile, its no wonder this simple fruit is so beneficial in helping us look and feel our very best! Ready to try using banana in your hair or skincare recipes? Check out USDA Certified Organic Banana Fruit Powder. And try the easy-to-make recipe below! This soothing all-over body masque is sure to warm your body and your senses. The beneficial clays, goat milk and antioxidant benefits of cocoa will leave you feeling relaxed and will leave your skin feeling soft and smooth. To Hydrate: Use any liquid you desire – water, milk, yogurt are all fine choices. Make a nice paste by mixing your desired liquid with your powder. BE SURE TO AVOID METAL when hydrating your masque as metal can react with clay. Leave on for 15 minutes or longer if desired then rinse thoroughly.Please note that this recipe has not been challenge tested for preservation efficacy. If you use this recipe for market sales, it is up to you to ensure the safety of the product.